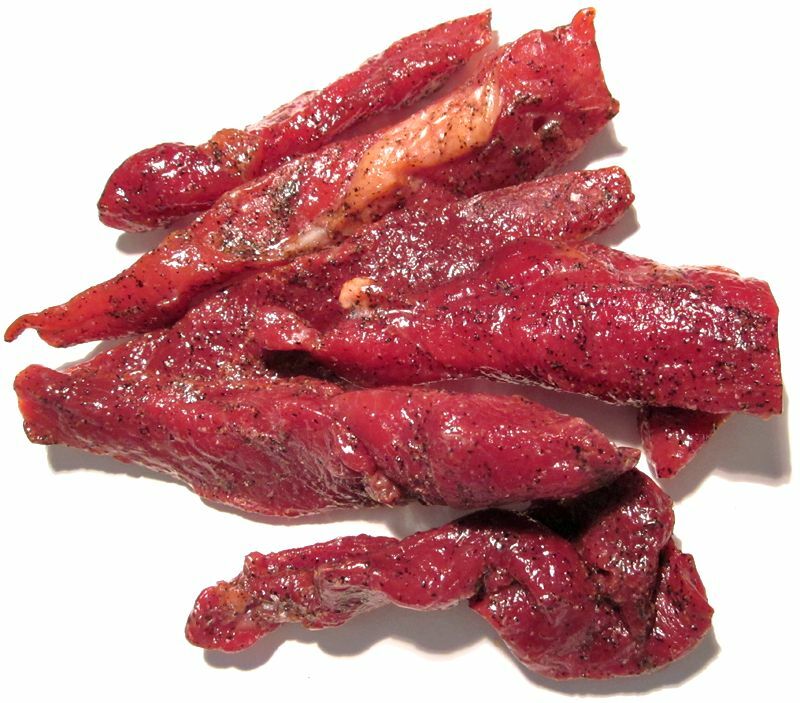 Next in the series on Wilderness Jerky Outlet is this Smoked Wild Boar jerky. Read my review of their Smoked Beef Jerky. The package label on this Smoked Wild Boar goes on to say, "Wild Boar from ferral swine". I also have their Honey Barbecue Smoked Wild Boar which I'll review next week. This particular wild boar jerky was manufactured by Michigan Brands, Inc., a company that makes jerky for a lot of other Michigan-based jerky companies. Wild boar, brown sugar, salt, sugar, spices, onion, garlic, sodium erythorbate, sodium nitrite. The first thing I taste from the surface of these pieces is a lot of sweetness, followed by a light smokiness. A few seconds later, I start getting some saltiness, and a touch of spice of some sort. The chewing flavor starts with a well-noticeable natural meat flavor, an increased saltiness, and a slightly stronger spiciness along with some black pepper. 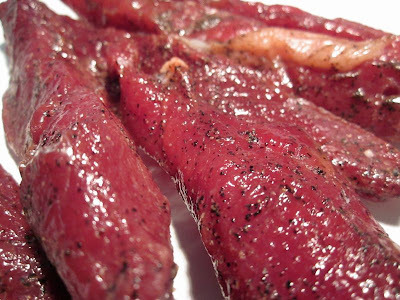 The flavor that seems to define this jerky is the natural meat flavor. For being "wild" boar, I do pick up a bit of a gamey taste, but not really that much. It tastes very much like smoked and cured pork. The smokiness is just lightly noticeable. It's more salty than it is smoky. Assuming the animals used in this jerky are in fact feral swine that was captured in the wild, and were feeding themselves on whatever berries, roots, bugs, lizards, and rotting carcasses they came across, it might have a strange flavor to it. But then again, I've heard of farms that raise wild boar on standard feed specifically for meat processors. And also, wild boar can be anything from razorbacks to domesticated pigs that escaped farms. So who knows what this is really is? But aside from the natural meat flavors, there's a light garlic & onion flavor to this, and a stronger black pepper flavor. The level of saltiness in this seems to be at a medium level. I'm getting a light bit spicy burn in the back of my mouth after several bites. The heat is light enough for me that I'd still rate this as "mild" on my hot scale, but I think many of you might see this as being more spicy. Overall, you're going to notice the natural meat flavors, tasting more like standard pork, but maybe a touch gamey. Then it's pretty much a medium saltiness, some black pepper, and a light touch of garlic & onion. These are slices of whole meat, sliced into thick strips of about 3 to four inches in length. This is a moist jerky, with a wet surface feel. The strips don't have much flexibility in that any amount of bending will cause it to crack open. Biting off chunks is relatively easy, and chewing seems relatively easy also. The chewing texture starts out feeling like a cold chunk of meat, not stiff, but not soft, but much like real meat. It doesn't offer much chewing resistance, breaking down right away. It only takes about 10 seconds of chewing until its down to a soft mass, and at that point it chews like a real piece of pork, like a thoroughly cooked pork chop. Each of these strips have visible chunks of fat of smaller or greater degree. Yet I found nothing unchewable in this, and very little stringiness. As for clean eating, it's leaves behind a lot of water, oil, and stickiness on my fingers, requires a finger-licking with each handling before touching my keyboard. 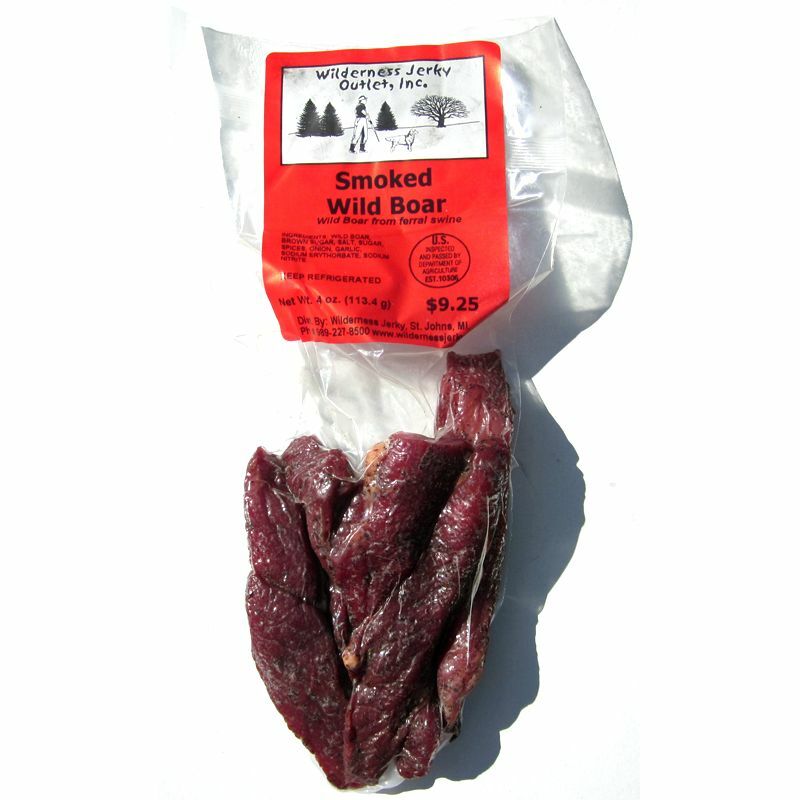 Wilderness Jerky Outlet sells this Smoked Wild Boar from its website at a price of $9.25 for a 4oz package. I bought several other of their jerky varieties and sizes for a total of 32oz at $62.00. They waive the shipping if you buy over $50.00. That worked out to $1.94 per ounce. For general jerky snacking purposes, at the $1.94 per ounce price, it seems to provide a good value. I'm getting a good deal of snackability for its overall good flavor, good meat consistency, and good chewing texture. That's close to what you'd pay for the major brands of jerky at grocery stores, and this certainly provides a lot more snackability. As a wild boar jerky, at the same $1.94 price per ounce, it's an excellent value. Other brands are selling wild boar jerky for much higher than that, and yet this jerky seems to offer a good flavor and meat consistency for the dollar. This Smoked Wild Boar from Wilderness Jerky Outlet offers a good deal of natural meat flavors tasting just a touch gamey, but overall mostly like eating cured pork. There is a bit of a smokiness to this, but not all that much. I would have wanted more smokiness considering this is named "Smoked Wild Boar". Overall, it's actually pretty good but I just didn't find anything that made me open my eyes and think "wow this is awesome!" The seasonings are fine, mostly a saltiness with black pepper and touches of garlic & onion. But that kind of blend is not all that unusual anyways. I think it would've been better with a stronger smokiness. The meat consistency is actually pretty good except for some of the liberal chunks of fat on this. But otherwise it chews like eating a well-cooked pork chop. This is actually the first wild boar jerky I've reviewed here and considering that, I'm impressed with this. My recommended beer pairing for this, go with a pale ale that weighs more heavily on the malt, like the Firestone Double Barrel Ale, or the Karl Strauss Red Trolley Ale.